This tip is for other bloggers. Tip # 8: Keep your blog posts short and sweet. Use as few a words as possible to get to the point. We live in a text message, Facebook and Twitter world. Many of us are accustomed to communicating in 140 characters or less. 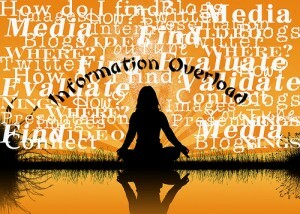 Most of us are suffering from information overload. I don’t know about you, if I see a big, long, wordy blog post I may not even read it or I may read the first few sentences and if they don’t catch my attention then it is click… away I go to the next piece of information to cram in to my head. Do you prefer long or short blog posts? Depends on the topic and the ability of the blogger to communicate clearly and accurately. Good point! I actually don’t mind long blogs if they keep my attention. I just find some to be so wordy that I lose interest. I know I have been guilty of being wordy but at least for business blogs I do think short is better. It depends on the content and how good it is. I learned when I wrote for USA Today how you can tell a complex story really well if you break it into smaller pieces. Blog posts should follow that model: long enough to give the reader all the key information and a way to learn more. Once in a while, I come across a post that is so beautifully written or a story so well crafted that I am happy to keep turning the page (er, I mean scrolling down.) But this is too rare. Oh, I am so with you on short blogs, though I truly do hate to say so because I love well-written complex stories–all the Russian greats, literary novelists etc.–but not so much in a blog. Though, I must say if I’m gripped by something that’s long I will read it. It seems we all agree if the content is good and useful the length doesn’t matter. It’s the long, boring, rambles we don’t make time for anymore.